CNT-II was seaplane for Schneider Cup racer. CANT-6 was three-engine biplane flying boat. CANT-7 was single-engined training flying boat biplane. CANT-10 was twin-engined flying boat airliner biplane. CANT-11 was seaplane built for the Schneider Cup racer of 1924. 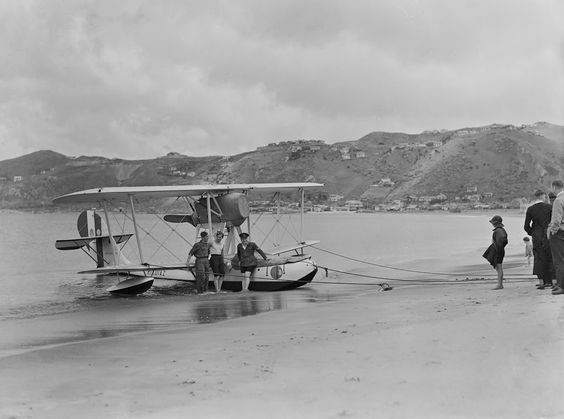 CANT-12 was single-engined seaplane biplane. CANT-13 was single-engined two-seat amphibian biplane. CANT-18 was single-engined seaplane for advanced trainer. CANT-21 was reconnaissance flying boat, similar to CANNOT 10 and 13. CANT-22 was three-engined airliner seaplane. CANT-23 was landing airliner aircraft. CANT-25 was shipboard single-seat biplane flying boat fighter. CANT-26 was two-seat biplane landing trainer. CANT-27 was commercial transport seaplane flying boat. CANT-35 was seaplane reconnaissance and bomber lightweight biplane. CANT-36 was a biplane advanced trainer. CANT-37 was developed from CANT-35. CANT-38 was seaplane biplane reconnaissance and light bomber. Z-502 & Z-503 were developed from Z-501 (not sure). Z-504 was shipboard reconnaissance biplane flying boat. Z-507 was a torpedo bomber version of Z-506. Z-508 was three-engined seaplane reconnaissance and bomber. the Z.506A for use as a mailplane. Z-510 was twin engined reconnaissance/bomber floatplane project. Z-511 was a four-engine long-range seaplane airliner. Z-512 was strategic Bomber Flying Boat. Z-514 was a floatplane version of Z-1018 bomber. Z-515 was twin-engined reconnaissance seaplane. Z-516 was a seaplane bomber. Z-1003 was three engined airliner project. Z-1004 was three engined airliner project. Z-1005 was three engined bomber project. Z-1007 was three-engined medium bomber. Z-1008 was developed from Z-1007bis as a bomber also,with four engined,project. Z-1010 was four-passenger high-wing light transport monoplane. Z-1011 was a twin engined low-wing bomber/transport aircraft. Z-1012 was three-engined low-wing airliner monoplane. Z-1014 was four-engined long range heavy bomber. Z-1015 was all-metal bomber version of Z-1007. Z-1016 was a proposed single engine derivative of the Z-1015. Z-1017 was three engined torpedo bomber developed from Z-1015. Z-1018 was twin-engined medium bomber. Z-1015 was initially a civil derivative of the Z-1007: a long-range, high-speed mailplane. It was designed for regular postal flights between Italy and South America. The wings etc. were taken from Z-1007, only fuselage was new - smaller, aerodynamically faired as much as possible. Z-1015 was made of wood, as well as its progenitor. The only Z-1015 prototype was flown on January 20, 1939 by Mario Stoppani. Initially it was powered by the same engines as Z-1007: three Piaggio P-XI, 1000 hp each. But at that time a new engine was successfully tested by Piaggio company - P-XII RC-35, delivering 1500 hp power. The CANT company managed to obtain three of them from pre-series production, and mount them on Z-1015 instead of P-XI. With new engines and new D'Ascanio variable-pitch propellers, Z-1015 reached 557 km/h at 4500 m altitude - excellent result. But in 1940 Italy was engaged into war, and pure civil Z-1015 became inactual. But its performance intrigued the Air Force: they borrowed the prototype, repainted it into camouflage, assigned serial number MM512 to it and transmit it to Gorizia, where torpedo bombing training center was placed. Z-1015 lost some internal fuel tanks and obtained external crunches for torpedo instead, but any defensive weapon wasn't installed. So, it became an unarmed torpedo bomber! The tests indicated that Z-1015 could drop a torpedo from 100 m altitude on 425 km/h speed, which was favourable speed for smooth submersion of the torpedo and its targeting. Generally, Z-1015 was better than production SM.79 torpedo bomber; but even to produce appropriate numbers of existing aircraft types was difficult for Italian industry, and they decided not to put Z-1015 into production. Source: V. Nĕmeček. CANT Z-1015 / Letectvi+Kosmonautika (L+K), No.11/1978. The drawing is by Stanislav Smékal; the color profile from L+K No.15/1978 is by Miroslav Balous. may be version of Z-506,and Z-1005 as attack aircraft project,any confirm for this. here is a rare 3-view to CANT-23,also with rare picture to CANT-38. Below is my version of a CNT/CANT designation list. It adds some details but no new model numbers to Hesham's list. I have put in holding numbers for Models I/1, III/3 through V/5. I strongly suspect that designations such as 'CNT-I/CNT-1', 'CNT-III/CNT-3', 'CNT-IV/CNT-4', and 'CNT-V/CNT-5' are unicorns. The original designation of the CNT-II/CNT-2 racers was D.G.A.3 (being designed by Alessandro Guidoni, director of the Direzione Superiore del Genio e delle Costruzioni Aeronautiche del Ministero dell’Aeronautica). If others of those unaccounted for 'designations' also sprang from outside designers, likely they initially had non-standard designation applied too. Air History lists three "CNT Cant 3" (I-AAKX c/n 191, I-AAKJ c/n 192, and I-AAKY c/n 193 going to SISA at Portorose in 1930, then to the Regia Aeronautica in 1933). All of these 'CNT Cant 3s' seem to actually be CANT 18s. The prototype of what became the CNT 6 was designated CS 6 (for CNT Silurante 6). So, a role suffix letter following 'C' for CNT. Other designs from Raffaele Conflenti among those unaccounted for 'designations' likely followed suit. Designation like 'CNT-I' or 'CNT-5' might have been applied retroactively (if at all). Some 'missing designations' might be accounted for by the SIAI S.55 and S.59bis built under license by CANT in 1927-1932. CNT and CANT designations are seen with hyphens and periods but I've written them with a space (which seems to have been the contemporary CNT/CANT practice). Some sources use 'NC' as if it were a designation - eg: NC.40 for the CANT 6ter, I-ONIO. Of course, 'NC' simply stands for Numero Costruzione. - CANT 12: 1 x 250 hp I-F V.6 6-cyl pusher, span ?? - CANT 13: 1 x 400 hp Lorraine Dietrich 12Db, span ?? Excellent work my dear Apophenia. "[The end of the war in Ethiopia removed the urgent need for an Italian aircraft carrier and] also ended hopes for the 14,000t carrier [design], which was cancelled despite the order already placed for the fighters (the Caproni Ca.165 biplane) and the torpedo-bomber (a single-engined, more powerful Isotta Fraschini version of the little Cant. Z.1012 which, at least in theory, had performance characteristics analogous to the Japanese Nakajima 'Kate')." Many thanks for this Info Sherman. The Cant Z-1005 bomber (never built) can be considered an embrional forerunner of the Cant Z-1007 ? In my humble opionion, yes, since both aircraft were bombers and had three Isotta Fraschini Asso engines, moreover the same bomb load (500 kg). The strange feature of the Cant Z-1005 was the installation of a fixed machine gun on each wing root, firing forward. 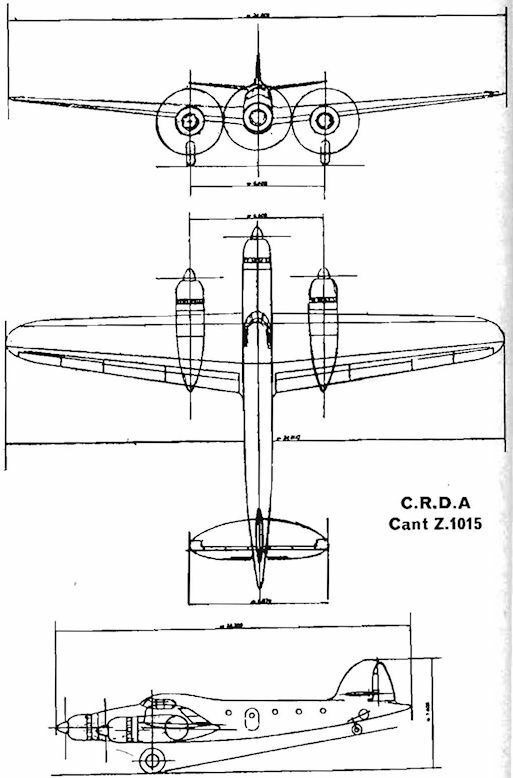 Are there somewhere some drawings of the Cant Z-1005 ? No,unfortunately there is not drawing for it Carlo. was that an Info about Z-1017,or it was a misprint. Z.507 - [Project] 193? torpedo-bomber Z-506B deriv. - Z.1015 : Init., 1939 long-range mailplane Z.1007 deriv.